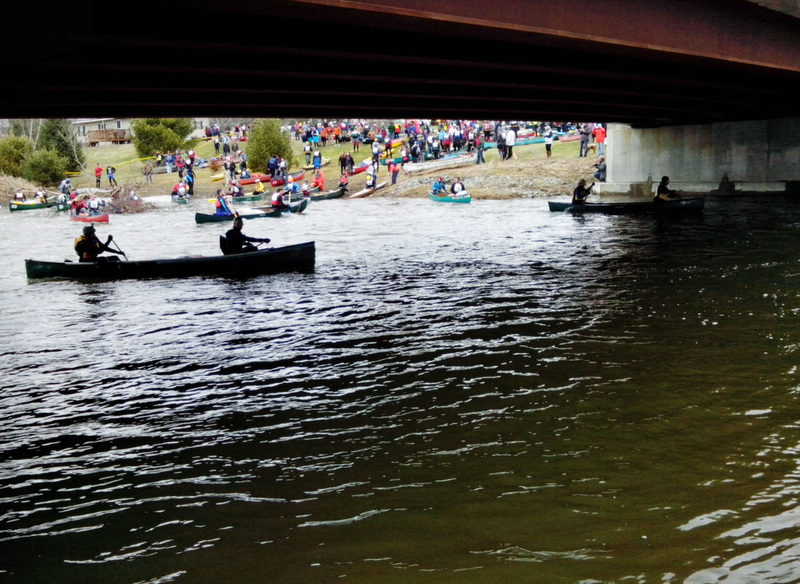 The river was roaring (without mercy) as canoeists, kayakers and paddlers of all kinds stabilized themselves into position at the starting line at the 2014 Kenduskeag Stream Canoe Race. This race highlights what Bangor and the surrounding areas can create when there is a collaboration between residents and people from away, an event that is unique, fun for all and the biggest of its kind in New England. In 1967, two Bangor residents wanted to create a citywide bike race but were met with an uninterested audience. 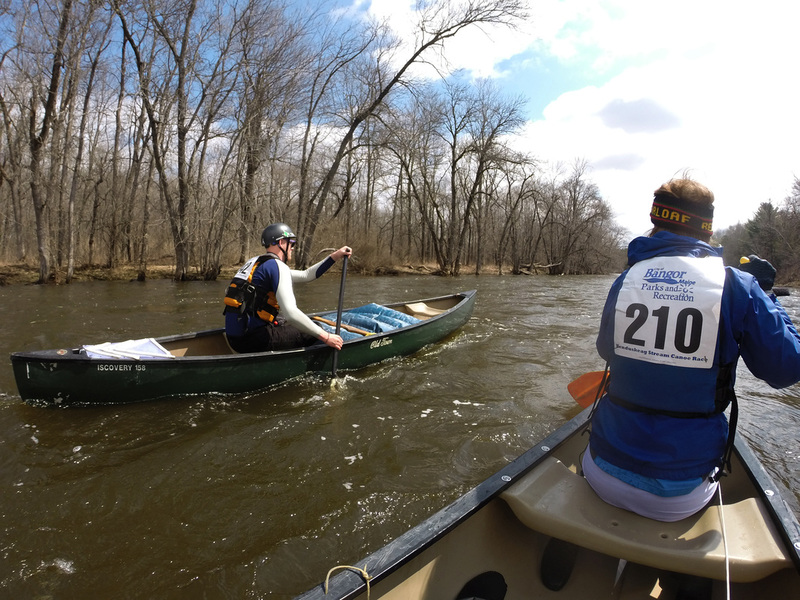 Instead of giving up on a citywide event, they starting thinking creatively, and proposed the idea of the Kenduskeag Stream Canoe Race to the Bangor Parks and Recreation department. Tracy Willette, Director of Bangor Parks and Recreation, said they wanted something to do in town. Maine winters can be brutal on people living in the state and Willette said when signs of spring are finally here people want to get outside and enjoy Maine's beauty. By sponsoring an event that is not only unique but fun, Willette said the race draws individuals from all over the state and county to come and test their river skills. Competitors from various skill levels round one of the first corners of the race. In the mid-90s, 15,000 paddlers competed in the race, but Willette said that numbers have gone down because of the competition of similar races that have been established across New England and the country. 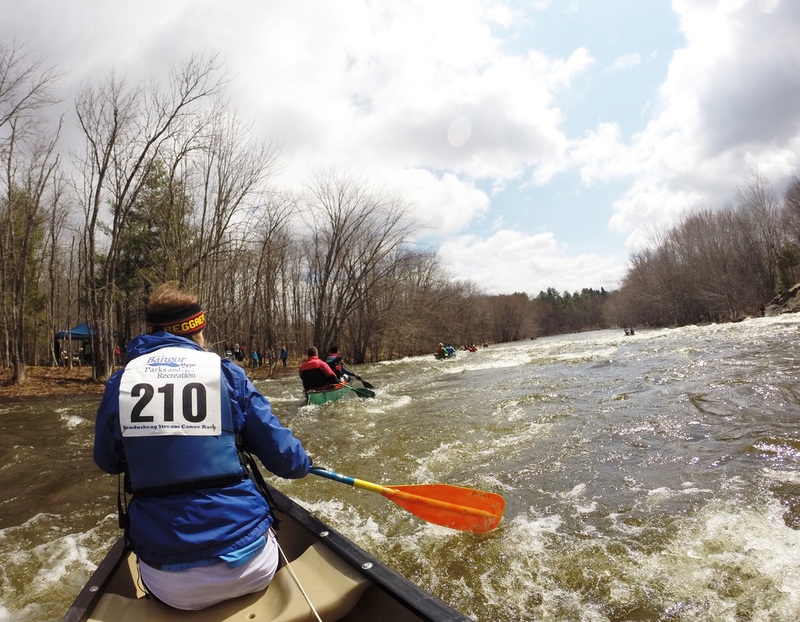 The Kenduskeag Stream Canoe Race still remains the largest paddling race in Maine and in the greater New England area. Adding to the race's atmosphere are the hundreds of spectators that line the shore and stand on the bridge that overlooks Six Mile Falls. Local media, amateur and professional photographers and residents from the surrounding area watch as participants either fly over this technical area or end up capsizing into the river. Five boat in five minute intervals, per competing class, leave the starting line starting at 8:30 a.m. on race day. This 16.5 mile race starts in the town of Kenduskeag and runs into downtown Bangor. This year marked one of the fastest races this stream has seen since it was established due to high waters. The finish line was moved up about a mile, Willette said. The race’s finish line was at the first mandatory portage at Four Mill Dam on Valley Avenue in Bangor. Competitors were told if they continue on towards the usually finish line in downtown Bangor they would be doing so at their own risk. The high water did deter some individuals from competing, with only 375 racers crossing the finish line, making this years event relatively small compared to past races. Racers encounter many technical spots throughout the course that requires them to stay alert and aware of what the river is doing. "The water was definitely higher than they other times I have competed," Paradis said. "It made it less technical because you didn't have as many rocks to worry about, but Six-Mile falls was huge. It was a lot bigger than last year." There are a lot of technicalities involved in the race, tasking Bangor Parks and Recreation to make sure they are cautious as possible without ruining the fun of the event. Through advising and established regulations that competitors have to follow, they leave nothing to chance, but Willette said there are chances of unforeseen risks that can happen during the race. “The race is relatively safe - we have been very fortunate over the years with only minor issues,” Willette said. “We have a lot of help from volunteers … Bangor Fire department and we coordinate with Dirigo Search and Rescue and Lincoln Search and Rescue. A lot of folks help out with the event." The volunteers focus on the race's trouble areas, Willette said, where paddlers are most likely to be dumped out of their canoes and kayaks. These trouble spots include the infamous Six-Mile Falls, as well as Maxfield Mill and Flour Mill. Volunteers also monitor along the shore. Willette emphasizes that, with the possibility of taking a dip into the water, participants need to dress accordingly. Willette recommends wearing wet suits or dry suits, or clothing that is going to dry quickly. That means noo cotton. All participants are required to wear life jackets, and kayakers are required to wear a helmet. Rebecca Settele, competitor in the women's recreation class, enjoys her escape from a hidden technical spot, as competitors behind get sucked into the river. Just in case competitors do find themselves slightly wetter than they anticipated, Bangor Parks and Recreation provides a warming tent at the end of the race for all of the participants. Normally there are a couple of tents that have food and hot beverages for race participants, volunteers and spectators. 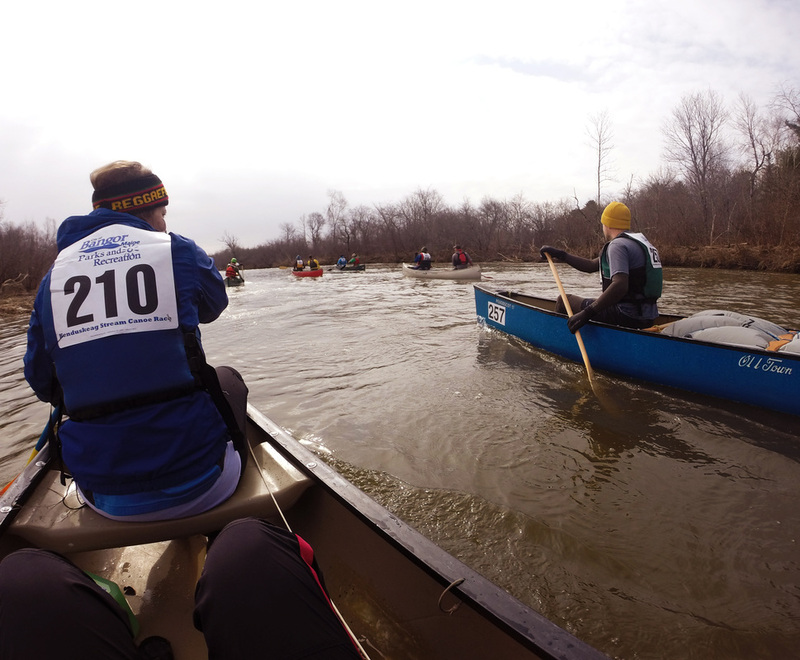 Twenty-five different classes make up the Kenduskeag Stream Canoe Race, ranging from beginners to experts, and an open class where an assortment of boats (from paddleboards to river rafts) can enter. Willette said the people that partake in the event vary from only canoeing once or twice in their life to competing competitively, but that that variety is what makes it fun. Two female competitors have some fun and dress up as cast members from the TV show, Duck Dynasty, evening wear beards as the make their way down the race course. Willette said they send five boats per class in five-minute intervals down the stream, beginning at 8:30 a.m. This process usually takes about an hour and a half to complete. Once you are in the water, how long it takes to get to the finish line is all up to you. There are 25 classes that participants can register for, including an open class where a variety of boats and team members can join. “The competitive classes usually take about two and half to three hours to complete. After that it depends on the water level and the ambition of the paddlers,” Willette said. It is not uncommon for participants to give up throughout the race, which is allowed. However, Willette said they only provide transportation from the finish line back to the town of Kenduskeag, which is a 15–20 minute drive from downtown Bangor. The Kenduskeag Stream Canoe Race is a tradition that Willette said they plan on continuing, hopefully for another 48 years.